Innovation is no longer the exclusive domain of the Silicon Valley elite. Reverse Innovation will open your eyes to the fact that the dynamics of global innovation are changing—and if you want your firm to survive, you’d better pay attention. No longer will innovations travel the globe in only one direction, from developed to developing nations. They will also flow in reverse. CEOs of the world’s most influential companies agree and have cited Reverse Innovation as their playbook for the next generation of global growth. Can You Fill the Innovation Gap? As told in most books, the story of Gatorade is the typical tale of innovation in a developed country that then spreads around the world. A sports drink designed to rehydrate athletes, Gatorade was developed by a professor at the University of Florida. There’s another detail in the story, however, that is usually not known. In the 1960s, when western doctors went to Bangladesh and other Southeast Asian countries to help fight the cholera epidemics of the 1960s, they discovered a local concoction used to treat the dehydration caused by cholera-induced intestinal illness. It included such ingredients as coconut water, carrot juice, rice water, carob flour and dehydrated bananas — basically a solution of carbohydrates, sugar and salt. The treatment was featured in a medical magazine that was read by a doctor at the University of Florida. Thus, the core innovation for Gatorade actually originated in an emerging market. This is an example of what Vijay Govindarajan and Chris Trimble, professors at Dartmouth’s Tuck School of Business, call "reverse innovation." Instead of an innovation originating in an industrialized market and then "tweaked" to fit the needs of an emerging market, reverse innovation is developed in an emerging market based on the needs of that market. 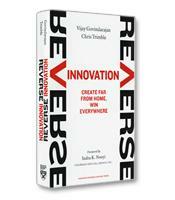 Eventually that innovation makes its way to developed markets, "reversing" the traditional path of innovation. 1. The Performance Gap. Customers in emerging markets are prepared to make sacrifices in performance at the right price. 2. The Infrastructure Gap. Emerging markets don’t have the infrastructure that exists in developed countries. 3. The Sustainability Gap. Developing countries face the most daunting environmental and sustainability challenges. 4. The Regulatory Gap. Regulations are few and far between in developing countries. 5. The Preferences Gap. Every country has different tastes and preferences. Each of these five gaps present opportunities for different innovation strategies, the authors write. Customers in emerging markets will buy products that perform at 50 percent of the performance level of their developed countries counterparts — as long as they can get those products at 15 percent of the price. Customers in these markets also need solutions that don’t depend on infrastructure, and are very interested in sustainable products. Less regulatory hurdles can create opportunities to develop and distribute new products more quickly. Finally, markets exist for products that cater to a country’s tastes. The five need gaps illuminate the strategies that multinationals can use to develop successful innovations in emerging markets, write Govindarajan and Trimble. In addition, multinationals seeking reverse innovation must also change their organizational mindset and project management approach to succeed. Reverse innovation must also be part of the mindset of the entire corporation, not just a preoccupation for expatriate units. "Put the spotlight on emerging markets through the use of expatriate assignments, immersion experiences, corporate events that are held in emerging markets, creative board appointments and high visible CEO actions," the authors write. At the project management level, the authors urge companies to set up what they call "local growth teams" or LGTs. These LGTs must be built from the ground up and managed as separate new companies, preferably run by outsiders (as opposed to inside managers who have worked their way up). Starting from scratch, the LGTs must develop clean-slate solutions based on clean-slate needs assessments. The second half of the book is dedicated to a series of case studies demonstrating reverse innovation in action. One example: GE’s electrocardiogram (ECG) machines made specifically for the resources of Indian customers. Govindarajan and Trimble have written a succinct and insightful manual that offers new strategies for companies seeking to take advantage of the potential of emerging markets.